Can you imagine what a student thinks when trying to study? How hard it can be for some to really stay focused on their learning materials when there are so many distractions surrounding them? Online ads and social media channels can be greater reasons for procrastination than the fridge or noisy roommates. Why? Because they demand a minimal level of energy: it’s way easier to snap a picture of one’s notepad and desk, captioning it with studying hard, do not disturb, posting it on Instagram and also tweeting it, instead of getting up and walking to the fridge. Being online while studying can be very distracting. And the ironic part is that teachers’ requirements can actually be the cause for students to be connected to the internet when learning. How else could they do a serious research for a paper, or find other useful information? Even when having the best intentions, students can get off track when studying online. For example, they go to YouTube and watch a video related to a certain lesson, a video provided by their teacher. They pay attention to it. Once it’s finished, they click on some related video about the topic, which is not required for the class. That video may be interesting, but it isn’t necessarily useful for their lesson. And maybe after that they see an ad with a new movie trailer they want to see. Since the trailer is usually a few minutes long, and the temptation big enough, there are high chances it will be watched. But once interrupted, it can be really challenging for a student to get their focus back. Keeping focus and motivation is not as easy as in a classroom setting, where the teacher has some control over the learning environment for students. Between all the social media postings, pop-up ads, and all the notifications on the multiple devices students use on a daily basis, being focused while studying can sometimes be quite an endeavor. So, what can one do? Well, hats off to technology, and all the productivity apps, online tools, and browser extensions that help us stay focused. Especially browser extensions. 1. Stay Focusd: This is a productivity extension that helps you…stay focused on your work. It limits the time spent on various sites that get our attention more than they should. In the case of students, these sites can be Facebook, Twitter, Instagram, Snapchat and any other social media channel, and also sites like CollegeHumor or BuzzFeed. 2. TimeStats: This handy extension monitors how much time the user spends on one website or another, and creates a colorful pie chart to depict this information. Students can use this extension if they want to be aware of the amount of time they spend on time-wasting websites instead of studying. They might be surprised at how big a slice for a seemingly harmless website can be. By having a better overview of their web activity, students can act on it,if they really want to. 3. Google Similar Pages: This Chrome extension is quite helpful and time-saving for anyone doing online research, especially when you have a hard time finding what you need and are out of new ideas. What it does? When you’re on a useful website for your research and have this extension active, it suggest new webpages with similar content. You just need to click the dedicated icon and you instantly get pages with new sources of relevant content. Your students will love you for this. If they don’t already know about it, of course. 4. CleanPrint: Some students really need to handle text on a piece of paper when studying. They can highlight keywords and paragraphs and make annotations on the margins. So they print at least a part of their online learning materials. CleanPrint helps them edit the articles on a webpage before they print or save to PDF, by removing the ads or pop-ups, resizing pictures, and even adding comments and notes. They get a clean and clear document, use less paper and waste less ink. Win, win, win. 5. The Great Suspender: Everyone is guilty of opening up too many tabs at once. I do it, you know you do it, and your students do it as well. Sometimes, it really is necessary. For example, a student can have their online course open in one tab, the current lesson in another, the assignment in another, some research materials in another two to ten, and maybe even something interesting but not related to studying in another one! The problem with running too many tabs at once is that they drain the browser memory and slow everything down. The Great Suspender solves this issue by suspending inactive tabs. It automatically unloads each tab while keeping its favicon and title text. You can then restore everything with one click on the page. 6. SpeakIt! : This one is really genius. It reads text to you. You as an online user just need to select it. Some students are auditory learners, so they prefer to listen to something that have to learn instead of reading it. They pay more attention this way. This extension is very useful for dyslexic and visually challenged students, because when they also hear the words they see on a page, they actually learn to read or improve their reading abilities. 7. Adblock Plus: Probably the most famous browser extension ever. AdBlock Plus is great for everyone who spends time online and wants to focus on the content of a certain page without getting distracted by annoying ads. 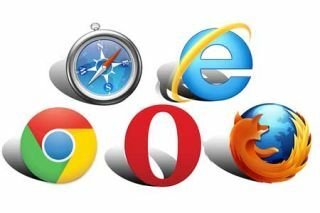 Students who learn online can greatly benefit from installing it in their browsers. It prevents distracting ads from showing up right in the middle of the content they are reading, so they can focus better on it and learn. 8. Adblock for YouTube: As many learning materials come in the form of educational videos on YouTube, students spend quite a lot of time there. Ads that show up at the beginning of a video are just as annoying as those on regular webpages. So AdBlock created an extension that specifically removes unwanted and time-wasting video ads. 9. Dropbox for Gmail: When it comes to e-learning, all teaching and learning materials come in a digital format. Dropbox is a safe place for keeping online documents, videos, audio files, images, presentations, and any other sort of project you or your students are working on. It can be accessed from any device, both online and offline, and it is also a great tool for sharing resources and assignments. The Dropbox for Gmail browser extension makes everything just one click away. You and your students can send and preview Dropbox files without leaving your Gmail window. 10. Save to Pocket: The internet is full of interesting information, but we don’t have time to read it all. Some websites get a spot in a bookmarks folder, but this isn’t always the best way to handle all the useful things we find online. With Save to Pocket, students can save articles, videos and pretty much any learning material directly from the browser or social media app. Once they put it in there they can access it at a better time, from any device, even without an internet connection. The list of free extensions supporting students with their online learning could go on forever. Every week there’s a new one bursting onto the scene. The ones listed above are just a few that I find very handy when dealing with digitised content, especially for students. Do you have one that your students love that isn’t on the list? Do share it and I’ll be the first to test it. Olivia Doboaca is a marketing analyst and part-time blogger for CYPHER LEARNING, a company with two Learning Management System products: NEO and MATRIX.